The tiny figure of a hobbit stands on the edge of a precipice, shrouded in a surreal haze. With an eerie glare flickering across his face, he clutches a chain in his grimy hand, staring mesmerized at the golden Ring dangling in front of his bloodshot eyes. He’s trekked countless miles of barren wilderness through unspeakable hardship to reach the Cracks of Doom and cast the Ring into the churning red flames below. The fate of Middle-earth depends on him. All he has to do now is let it go . . . But Frodo simply can’t do it. It’s arguably the most shocking moment in the history of literature, and certainly one of the most misunderstood. Soon after The Return of the King’s publication, J.R.R. Tolkien received a “savage letter, crying out that [Frodo should] have been executed as a traitor, not honoured” (The Letters of J.R.R. Tolkien, 234). My own brother, while not reacting that harshly, nevertheless insists that Frodo Baggins utterly failed to complete his mission. Such a dreadful misunderstanding, however, is a tremendous affront to Frodo’s heroism that stems from a failure to realize the true nature of his mission. Regardless of his inability to literally cast the Ring into the fire himself, the fact remains that Frodo succeeds in doing all that was asked of him to the best of his ability, thereby fulfilling his role in God’s plan. As Tolkien himself described it, Frodo’s “real contract was only to do what he could, to try to find a way, and to go as far on the road as his strength of mind and body allowed. He did that” (Letters, 327). Let’s delve a little deeper . . . Above all else, The Lord of the Rings should be read from a spiritual perspective, with a keen eye for the subtle hand of God at work. Although God is never mentioned by name, Tolkien makes it clear that He exists and has designed a plan for Middle-earth that focuses on a humble hobbit from the Shire. 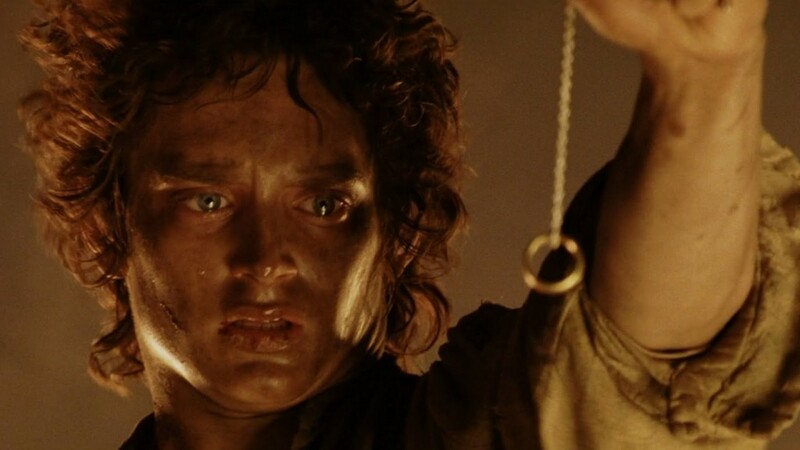 The intricate chain of events that places the Ring in Frodo’s possession prompts Gandalf to observe that it didn’t happen by chance, telling Frodo that “Bilbo was meant to find the Ring, and not by its maker, in which case you also were meant to have it” (The Fellowship of the Ring). In Tolkien’s own words, he “undertook his quest out of love – to save the world he knew from disaster at his own expense […] and also in complete humility, acknowledging that he was wholly inadequate to the task” (Letters). Moreover, as he reveals to Boromir, Frodo is afraid. He is just a hobbit, after all, not a wizard like Gandalf or a capable warrior like Aragorn, yet even though he knows he will be“flying from deadly peril into deadly peril” (Fellowship), he never wavers in his commitment. His true test is based not on whether he measures up to a narrow definition of success, but on whether he accepts the staggering responsibility entrusted to him. Also, Frodo does more than accept a merely difficult task; he accepts, literally, an impossible one, in which case he can’t be blamed for “failing” to complete it. The impossibility is evident from the beginning, before he even leaves the safety of Bag End. When Gandalf challenges him to throw the Ring into his own fireplace, Frodo finds “that he could not do so, not without a great struggle.” Even with “an effort of will,” Frodo tries“to cast it away – but found that he had put it back in his pocket.” If the Ring can exert such powerful influence over Frodo in the familiar comfort of Bag End, how can he, or anyone, possibly have the strength to resist the Ring’s power at its zenith, at the Mountain where it was forged? The author himself provides the answer when he writes,“the pressure of the Ring would [be] impossible for any one to resist, certainly after long possession, months of increasing torment, and when starved and exhausted” (Letters, 326). “Torment”only mildly describes the ravaging effects of the Ring on Frodo’s mind and soul, which only intensify the closer he gets to Mount Doom. Despondently, he tells Sam that “there is no veil between me and the wheel of fire. I begin to see it even with my waking eyes, and all else fades” (The Return of the King). As his mind and body deteriorate, he is powerless to retain control of his will through his own strength. He has no choice in the matter. Tolkien yet again provides some insight, writing that “some individuals seem to be placed in ‘sacrificial’ positions […]that demand powers beyond their utmost limits[…] in which a body may be destroyed, or so maimed that it affects the mind and will” (Letters, 327). While crossing the Dead Marshes, Frodo asks Sam, “ What hope is there that we ever shall [destroy the Ring]?” and confides that, “If we can nurse our limbs to bring us to MountDoom, that is all we can do. More than I can, I begin to feel” (Two Towers). Frodo is painfully aware that his task is hopeless, but instead of inducing him give up, his despair actually motivates him to continue. Endless miles of noxious swamps, barren wastelands, and rugged mountains don’t weaken his resolve; neither does exhaustion, hunger, or thirst. Even the power of the Ring itself, which Frodo feels as “The Eye: that growing sense of hostile will that strove […]to pierce all shadows of cloud and earth and flesh and pin you under its deadly gaze” (Two Towers) doesn’t tempt him to give up. He literally crawls up Mount Doom when his strength wanes, refusing to collapse and die. Certain that the Ring is his responsibility and his alone, he voices his determination to Faramir, insisting that he is “bound, by solemn undertaking to the Council, to find a way or perish in the seeking” (Two Towers). Frodo tries his utmost to complete his mission, persevering until the end, climbing his own Calvary with the fate of the world around his neck. Since he is just a mortal hobbit, how can he be blamed for needing to rely on divine help instead of his own merits? In Tolkien’s opinion,“the breaking of his mind and will under demonic pressure after torment was [not] any more a moral failure than the breaking of his body would have been – say, by being strangled by Gollum, or crushed by a falling rock” (Letters, 327). The final key ingredient that enables the quest to succeed – something so obvious that I can’t believe it’s so often overlooked – is his mercy towards Gollum. Frodo and Sam first encounter Gollum while lost in the Emyn Muil, shortly after leaving the Fellowship – and Frodo is suddenly confronted with his first temptation to kill the sly, dangerous creature. Remembering Gandalf’s admonition not to “deal out death in judgment” (Fellowship), however, Frodo refuses to give in, declaring, “I will not touch the creature. For now that I see him, I do pity him” (The Two Towers). Later, when Gollum is caught gorging on fish in the Forbidden Pool, Frodo spares his life a second time. Though he is tempted to let Faramir’s archers shoot so that he “need never hear that voice again,” he instead goes to retrieve Gollum himself, knowing that killing him would be against Gandalf’s wishes – as well as intrinsically immoral. Not in the least naïve, Frodo realizes even before they enter Shelob’s lair that Gollum is likely plotting treachery, but he accepts the fact that practicing virtue requires risk. As Tolkien writes, for Frodo “to ‘pity’ [Gollum], to forbear to kill him, was… a mystical belief in the ultimate value-in-itself of pity and generosity even if disastrous in the world of time” (Letters, 234). In other words, Frodo’s mercy would not have been in vain even if he had perished as a result, due to the objective nature of morality – but as it turns out, in a remarkable testament to God’s Providence, that mercy actually becomes his salvation at the Cracks of Doom. When Frodo is unable to destroy the Ring himself, Gollum intervenes and seizes it for himself, only to topple over the edge of the abyss and unwittingly complete the quest. Thus Gandalf proves to be correct in his prediction that Gollum has “some part to play yet, for good or ill,” (Fellowship) before the end, and by sparing his life, Frodo allows him to complete it. Therefore, Frodo succeeds in completing his part. As Tolkien says, “Frodo had spent himself completely (as an instrument of Providence) and had produced a situation in which the object of his quest could be achieved. His humility (with which he began) and his sufferings were justly rewarded by the highest honour; and his exercise of patience and mercy towards Gollum gained him Mercy: his failure was redressed” (Letters, 326). J.R.R. Tolkien didn’t intend to write about an action hero who conquers incredible odds and dazzles the world. On the contrary, The Lord of the Rings is a poignant depiction of human frailty and subsequent dependence on God. If Frodo had demonstrated his strength by simply tossing aside the Ring, we would have lost that crucial glimpse of God’s unseen Presence. Without that, we might even have taken satisfaction in the comfortable lie that we can do anything we want if only we trust our own strength. Thankfully, Frodo’s apparent failure jolts us out of our dangerous complacency, challenging us to open our eyes and confront the stark truth of our human weakness. We may not have to undergo an ordeal of such magnitude, but, like Frodo, we are also helpless to resist temptation if we presume to rely solely on our own strength. Like Frodo, we also depend on the help of God’s grace. Instead of condemning him for his “failure,” then, we should empathize with his heartrending struggle and draw inspiration from his determination to cling to virtue and persevere through all adversity. Frodo Baggins epitomizes the paradox of 2 Corinthians 12:10,“When I am weak, then I am strong,” revealing the astonishing marvels that God can accomplish thorough a single person with the humility to unreservedly surrender his life to Providence. What appears to be Frodo’s darkest hour is, in fact, his greatest triumph. So, from now on, let’s, acknowledge Frodo’s heroism and give him the credit he deserves. He did not fail. Thanks for addressing Frodo’s heroism. It’s difficult to find anyone who appreciates him for it; most people are really disappointed he didn’t just toss the Ring in the fire and be done with it. But he was a mortal being, as we are, and that’s what so many people miss. It was a work of a genius on Tolkien’s part to have Frodo NOT accomplish it by his own strength. Thanks for the word in poor Frodo’s defense! Anna Maria, I have just read your comment here on Ellen Virginia’s beautiful reflection, and I think it is quite simply profound. Imagine a heaven in which everyone feels that they are there because they are entitled to be so as a reward for a job well done. It would soon become hell and not heaven. Heaven is a place of the deepest gratitude that just keeps on growing deeper. Thank you for your wonderfully insightful essay on strength in weakness. It convinces me very strongly that Prof. Tolkien was above all else a theologically minded Christian. As a weak, limited, hobbitish person myself, I am in great need of being reminded of my utter need for God as my grace. I wish but once I could compose such a word as this. Thank you so much for you kind comments, everyone! Anna Maria, it certainly was a “work of genius” on Tolkien’s part not to have Frodo toss away the Ring through his own strength – that would have diminished the lesson for us and undermined one of the chief themes of the whole book. The idea that he failed never even crossed my mind when I first read the book in 2012 (the year this essay was originally published; I polished it up a bit before it was posted here); his heroism was so obvious that I couldn’t believe anybody – like my brother – could miss it. It’s an honor to come to Frodo’s defense! John C. Campbell, you are indeed correct – Tolkien’s devout Catholic faith permeates everything he wrote. We can all use frequent reminders of our dependence on God’s grace. The more I think about it, the more grateful I am for the reminder Tolkien gave us in the form of Frodo, a humble hobbit from the Shire. Indeed, if he had cast aside the Ring without any effort, it would have been rather discouraging to follow in his footsteps, because we could never hope to meet such an unrealistic height of strength! Since it did happen the way it did, however, we can take comfort. Just as God did not abandon Frodo in his weakness, nor will He abandon us in ours. SandyN, I’m aghast that even a panel of so-called LOTR “experts” can’t understand Frodo’s heroism! Thank goodness you came to his defense. I definitely agree that the “acclaim the other characters receive is a direct result of Frodo’s willingness to sacrifice himself.” Everything the others did was only to support Frodo. In fact, Aragorn says so early in “The Two Towers”: “With him lies the true Quest. Ours is but a small matter in the great deeds of time.” But so few people understand that . . . This is the main reason why I’m disappointed with the film trilogy, which no doubt distorts people’s perception of Frodo. It severely downplays his heroism, shining the spotlight on Sam and Aragorn instead. It cuts out so much essential dialogue and depicts Frodo as being stupid and gullible for “trusting” Gollum. I get the impression that the audience is supposed to think, “See, silly Frodo, none of this would have happened if only you had listened to Sam.” But that’s a rant for another time. Anyway, I’m so glad I’m not the only one who appreciates him. He is indeed a “sacrificial lamb” and a true hero, whose quiet strength and trust in Providence provides a valuable lesson to all of us. Thank you for this very persuasive editorial and character analysis, Ellen Virginia! I admit that I initially was pretty shocked by Frodo’s “the ring belongs to me” session at the edge of Mount Doom (I think I screeched “WHAAAAAAAAT??!! when I first watched the scene in “The Return of the King” 😉 However, I have since come around to appreciate the deeper perspective of Frodo’s human frailty highlighting God’s providential grace. And as you say, Frodo really did do all the was humanly possible to get the ring to the only place where it could be destroyed, and thus fulfilled his mission as far as his capacity enabled him. With regards to the Gollum misadventure, I do see what you’re saying with regards to Frodo being far less gullible in the books as opposed to the films. And yet I must admit I found Gollum’s possessive hold over Frodo in the films rather emblematic of the dangerous way the Ring was effecting his mind, even up to the point of turning of Sam and dismissing him. While it may seem extreme, I actually have experienced certain things in my own life which tend to mirror this pattern (i.e. a none-too-healthy influences altering people’s mental capacities in shocking ways! ), so it sort of rings true (pun not intended!!). Thanks for your comment, Rosaria Marie! I will always firmly hold the position that nothing, not even the Ring, could induce Frodo to betray Sam (or Sam to desert Frodo). While the scene in the movie can indeed mirror real-life patterns, it is still not what Tolkien wrote. I think the filmmakers should have respected that, because this is a deep character issue that goes way beyond the reasonable allowances for the page-to-screen translation. It does Frodo a tremendous injustice. But I’m glad you enjoyed my analysis of God’s providential grace working throughout the story! Oh, and I was rather shocked too when I first read the Mount Doom scene . . . But as I began to think about it, really delve into it, I came to, well, the conclusion that soon inspired this article. That’s what the ending to a wonderful story is supposed to do, isn’t it? Encourage you to reflect on it and look below the surface. It’s much more memorable that way. I’m glad Tolkien wrote it, not me – he knew what he was doing. Anyway, thanks again! This is an excellent analysis of Frodo and his successful Quest, encouraging as well as insightful. Thanks for sharing! Such a wonderful essay and tribute to our beleaguered and beloved Ring-bearer! Thank you! Frodo is an incredible inspiration. I will admit I was one of those too who first thought, “I love him, but he screwed up.” But then I went deeper and learned more and am deeply moved by his sacrifices and humility and self-giving to the utmost. He did not fail. He succeeded brilliantly for all the reasons you named. He was chosen from all time to be Ring-bearer, not Ring-destroyer, and so did his part so Gollum could do his, little did either of them know of it. Cheers to our dear hobbit! I hope he came to realize the truth in the Undying Lands. And cheers to Sam as well for making it all possible, loving Frodo to death and having pity on Gollum at the precise moment it was needed. Thank you so much for your comment, Anne Marie! I’m so glad you’re as moved as I am by Frodo’s humility and self-sacrifice. Indeed, he deserved to learn the truth in the Undying Lands . . . I hope he finally found peace he couldn’t find in Middle-earth. I had really expressed from the character of FRODO BAGGENS.A v little cute anglic face , innocent boy fights with the crul world of enemies.His beauty and his courage ,teach me to live a life and get me out of my stress 😢.Ooh really it is happens with me.FRODO (Elijah wood ) gives me the life.And still I follow him and .He recognized me life is v important and all the commitments r just need our concentration. Then it’s nothing a big deal …. Thank you so much for this quite wonderful reflection. What an inspiration these insights are for all who keep on going from day to day. A few years ago I read an address given by Adolfo Nicolás, the Superior General of The Society of Jesus, in which he spoke of the courage of ordinary life. Your reflection gives me a deeper insight into what that means and I am most grateful to you.